Everyone has strengths and weaknesses that show up at their job. However, for adults with ADHD, overcoming their weaknesses may present a greater challenge than their co-workers face. In the workplace, social skills and work production are highly scrutinized by employers. ADHD symptoms displayed in the workplace can have a large influence on how productive an adult with ADHD is at his or her job. Factors such as work environment, job task, coping skills, and workplace accommodations influence people’s chances for success. Every day, people must overcome these barriers to be effective in the work environment. Let’s look at some of the strategies proven effective in improving quality of work life. Many organizations focus on improving individuals’ weaknesses while ignoring what they do well. One theory trying to change this focus is called positive psychology, which, is a change in focus from trying to fix what is wrong with an individual to capitalizing on the best an individual may offer. Performance reviews and day-to-day feedback focus on what can be done better, but this comes at a huge cost. People who use their strengths every day are six times more likely to be engaged on the job, which has a positive effect on performance and the company’s bottom line. Unfortunately, studies reveal only 3% employees feel their supervisor and organization supports and encourages building on their strengths. The best way for you to maximize your team’s performance is by focusing on employee strengths. If every manager were trained to focus on leveraging their staff’s strengths, the number of engaged employees could double, saving the economy millions of dollars in lost productivity. Frankly, those numbers are likely to be much higher for your employees with ADHD. The ADHD brain is more able to focus when working on things that play to their strengths and so benefits even more than most from a strengths-based approach for their jobs. Additionally, when managing based on strengths, best practices suggest you not wait for the annual performance review to discuss an employee’s strengths. More frequent and timely feedback is often of greater value because it’s closest to the experience itself. Many employees, and perhaps more so for those with memory challenges, benefit from more immediate feedback on both strengths and challenges. How To Discover a Person’s Strengths? The first step towards shifting your focus to a strength-based approach is to identify your own strengths. Below are instructions for identifying your strengths. We also have links to the best-known strengths test that are both affordable (The VIA Character Strengths Test is free!) and effective, for both you and your employees. Think about activities you do in your work. Where do you excel? What do you do that gives you energy rather than leaves you drained? But just because something energizes you doesn’t mean it’s a strength. If your work often requires major revisions or extra effort, it may not be an area where you excel. Conversely, you might have great success in sales, but after each deal closes, all you can think about is never having to do that again. You’ll find your workplace strengths in the activities that both energize you and where you have been successful. Comparing yourself to others is a terrible way to find where your strengths lie. To help you stop comparing yourself to others, focus on recognizing and accepting who you are. In addition to self-reflection, it can be helpful to ask the opinion of a colleague or supervisor. Ask your co-workers, “What makes you call me for help?” After collecting three or four reasons why others come to you, you’ll have a better idea of what you’re good at. Want even more information about your strengths? The VIA Character Strengths Test and the Gallup Strengths Finder Test (now called the Clifton Strengths) are excellent tools to help you determine and clarify your thinking about your strengths. In the early 2000s, scientists began to bring character to the laboratory to study it. A 3-year project involving 55 scientists devoted to studying character traits through time was launched. This resulted in the VIA Classification of character strengths and virtues, a classification of positive traits in human beings. One of the key findings about character is that each human being has a constellation of character traits (character strengths) that make him or her distinct or unique. The VIA Survey of Character Strengths is a simple self-assessment that takes less than 15 minutes and provides a wealth of information to help you understand your core characteristics. Most personality tests focus on negative and neutral traits, but the VIA Survey focuses on your best qualities. In 2001, Buckingham and Clifton introduced positive psychology to popular culture with their book, Now, Discover Your Strengths. The assessment that emerged from this work and that of Don Clifton was known as the StrengthsFinder tool and provided insights into 34 potential strengths for participants. This assessment is now identified as the Gallup CliftonStrengths. Gallup Clifton Strengths provides an online assessment available for a fee if you would like to discover your specific potential strengths. Gallup also offers strength related tools for use in developing teams or furthering individual career development. The insights gleaned from these tools aim to help individuals, managers and organizations use their strengths to succeed at work, in their communities, and at home. By the time you walk into your performance review, you should know what your strengths are and be able to apply them in your work. No one can do that for you. Ideally, you were hired for those strengths, but you can’t wait for someone to tell you what your strengths are. And that’s true no matter where you find yourself on the corporate ladder. Your strengths are not based on your role, or perhaps your job title. Your strengths are personal characteristics that can be applied in every role. Every day presents opportunities to leverage your strengths. Ideally, managers will demonstrate a strengths-based approach by personally learning and working with their strengths. This will then allow them to model and ideally teach this approach to their teams. It is vital though, that managers realize that it is an approach of identifying and working from a place of strength. 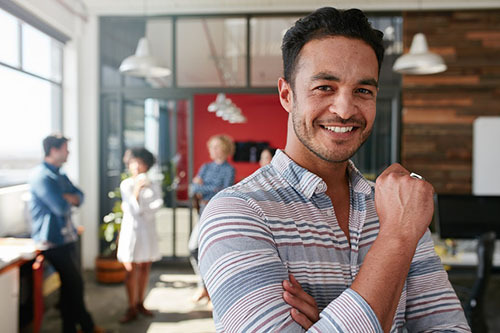 All employees will benefit from working from a place of strength, but this may have added benefit for employees, such as those with ADHD, who have a history of being penalized for limitations.